If you have thought long and hard, and you have decided to take up sailing; there are a few things you should know, besides that sailboats, like regular boats, also must be registered, should be insured, and boating education classes should be attended. Here are a few beginners tips, in no particular order, that just might make that first trip out a successful one. 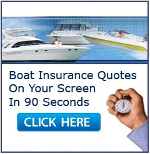 – Choose a small boat to start out with. Learning how to sail with a vessel that has less lines and sails may be a good idea. A small boat will be easier to maneuver and is perfect for practicing capsizes. Yes, you will read about that shortly. Capsizing on purpose. – Choose a body of water without a lot of other boats, PWCs, and people. It is best to practice your new sailing skills in the perfect of conditions. – There are certain basic safety rules that just make sense, no matter how experienced you are at sailing. Like always let someone know where you are going out on the water, always have your life jacket and a personal floatation device and know how to swim. – Check the weather forecast before you venture out. Be prepared for whatever the weather might throw your way. Always be sure to bring along adequate supplies and clothing/basic weather gear as needed. Being prepared is always the first step to successful boating no matter if it is sailing or power-boating. – To be successful at sailing, you must be able to adjust sail settings to take the best advantage of different wind and water conditions. A common rule is that sails should be relatively flat when the wind is either very light or very strong, and full when there is a moderate wind. – Now capsize your sailboat. Yes, I know it seems odd and a little backwards to get this suggestion, but it’s better and easier to learn by practicing how to handle a capsized sailboat when you are in control of your surroundings instead of as a surprise. Everyone learns better with experience and that experience will help more than you know when and if you ever experience a real live capsizing. – Do yourself and those on board your sail boat a favor and always remember the boom. People tend to get hurt as a result of forgetting about or not being aware of it in the first place and the boom swings around and gets them right in the head or worse, they go for an unplanned swim. Respect the boom. – Know the lingo before you head out for that first all important trip. 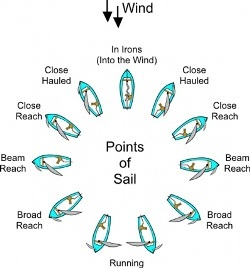 Know the difference between port, starboard, and all those other important concepts, like: Aft, Bow, Leeward, Windward, Boom, Rutter, Tacking and Jibing. Do a little homework and familiarize yourself with all the meanings. – Don’t try to self-teach yourself all the sailing basics ins and outs. Take a sailing class and learn all you can about safety on the water. Sailing is a beautiful recreational water sport with the sails tall and tight from the wind which is blowing through your hair. Keep everyone on board including yourself safe by taking a class. Be sure to get your new sailboat insured to protect your self, your friends, and your property. Great Post and useful tips. Starting boating safety at young age is a great idea. It can help foster a love for the water and boating, but it can also teach kids what to do in the face of an emergency, or how to stay safe in general. To be successful at sailing, you must be able to adjust sail settings to take the best advantage of different wind and water conditions.